Strawberry fruit ice and vanilla flavour dairy ice cream in a wafer cone (12%) with chocolate flavour coating (8%), strawberry sauce (5%) and white chocolate pieces (1,5%). The Cornetto Strawberry experience consists of a delicious, crispy-baked wafer, coated inside from top to bottom with a chocolate flavour layer, combined with a delicious vanilla ice cream and strawberry fruit ice, strawberry sauce and white chocolate curls. 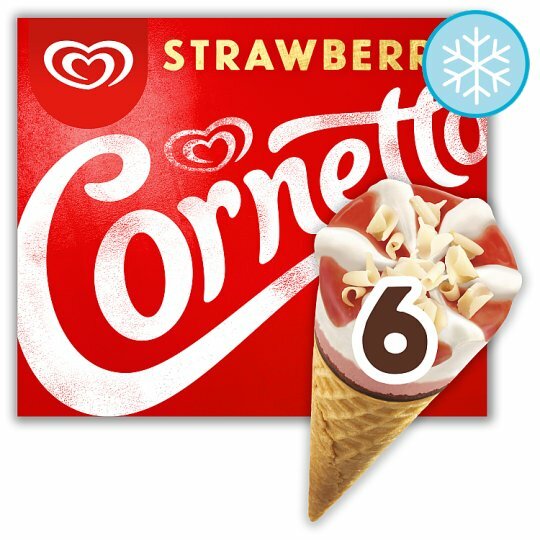 For over 50 years we’ve been perfecting our Cornetto recipe to make the taste of every Cornetto ice cream even better than the last, taking your taste buds on a delicious journey - from the tantalising topping, through the smooth ice cream down to the crispy wafer cone and of course the chocolatey tip. Spica, an ice cream manufacturer from Naples, was passionate about ice cream, loving creamy texture, delicious flavours and quality ingredients. One day Spica found a way to spread ice cream passion to everyone, creating a formula that could not fail. The great idea was to cover the inside of the cone with a chocolatey layer, allowing the wafer to keep its crispiness when filled with ice cream - this breakthrough innovation “Cornetto” was born from that moment on, people could enjoy their crispy, delicious Cornetto whenever they want. A crispy baked wafer coated from top to bottom with a chocolatey layer, combined with delicious vanilla flavour ice cream and strawberry fruit ice, topped with strawberry sauce and white chocolate curls. Creamy and Crunchy, the perfect match. We also have other flavours including Classico and Mint. Find us on Facebook, Instagram and Twitter and let us know your favourite flavour!